"Well, sir, there are other means of persuasion besides killing and threatening to kill." "Sure, but they aren't much good unless the threat of death is behind them. I'll make it a matter of your having to call it off or kill me, knowing you can't afford to kill me." That is an attitude, sir, that calls for the most delicate judgment on both sides, because as you know, sir, men are likely to forget in the heat of action where their best interest lies and let there emotions carry them away." Then the trick from my side is to make my play strong enough that it ties you up, but yet not make you mad enough to bump me off against your better judgment." Well, that's pretty much the dynamic at play in all of these 24/Lost clones. The hero needs to be sufficiently threatened to keep us on the edge of our seats, but not to the point of actually killing him or the adventure comes to an end – something like the Saturday matinee serial. This is hard enough to manage in a two-hour feature film (think: Indiana Jones as a successful instance), but stretches believability in a TV series (think 24 as a drama whose characters and situations frequently tipped the scales into comedy). 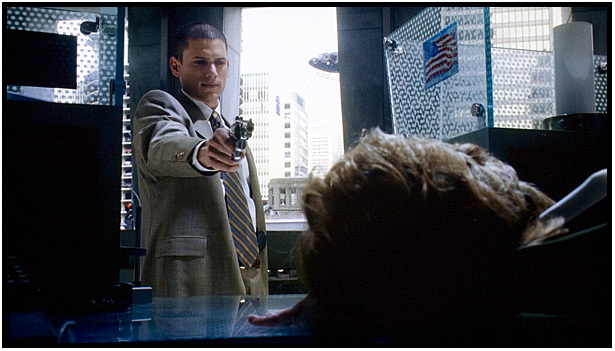 In a backhanded sort of way, Prison Break was more satisfying than the first couple of seasons of 24 because there was less disparity between the acting (so compelling and serious in 24) and the situations they found themselves in. 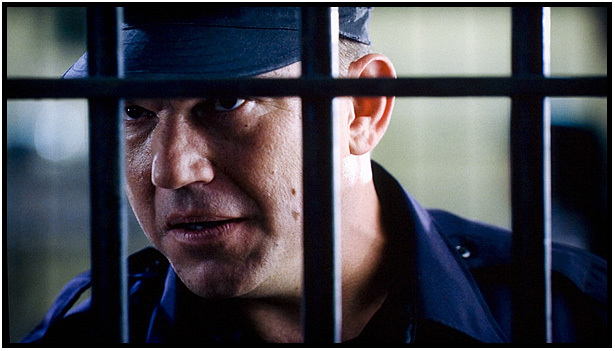 All the same, Prison Break is made from the same mold and carries with it some of the same baggage. But, if its hero were charismatic enough (which I feel he is, in a quasi-tight-lipped Steve McQueen sort of way), and the writing were good enough (which, like the rhythms of the series as a whole, doesn't find its way until Episode 6), and the cliffhanging situations seemed to have a certain plausibility, given the premise (good points here – no airbags required) and came at us at a pace that kept our interest (ditto) and provided chills rather than groans (ditto, again), the producers might have a good show on their hands. 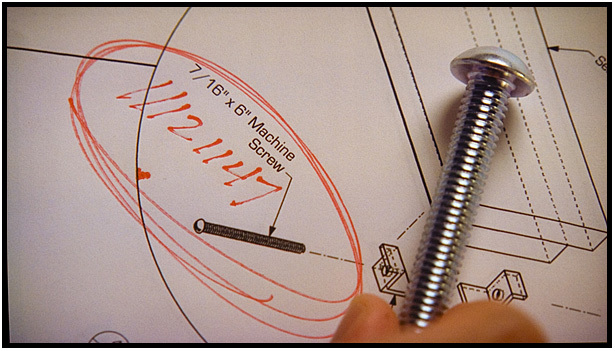 As the series progresses, some situations stress the plausibility factor: I don't know about you but I find series like 24 and movies like Murder at 1600 and Absolute Power are diminished by bringing conspiracy to the corridors of the White House. Heaven knows the present administration was fewer more vocal detractors than myself, but once you make presidents the perpetrators or victims of major crime, then where do you go from there? It is one of the weaknesses of this series that once again the White House is seen as the root of Evil. It's not that its preposterous, it's just demonstrates a lack of creativity. 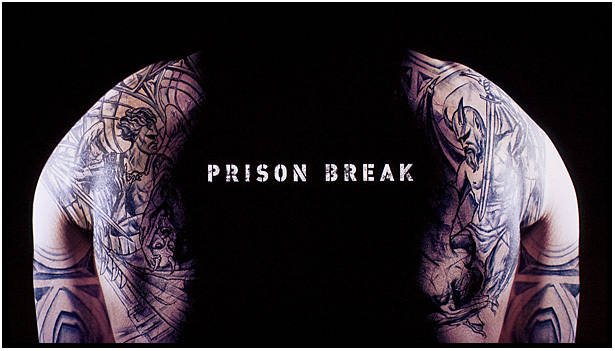 There are characters whose performances are less than interesting (I found Dominic Purcell exceedingly tedious as the Death Row brother as one example) – which kept Season One from being the killer series it might have been. Still, it is no small thing that clich�s are kept to a minimum (the perennial favorite being that a person who disables a bad guy in order to get away never ever finishes said bad guy off, and so finds him or herself in jeopardy a few frames later), though sometimes the writers figure out ways to recover even from the pitfalls of clich�. Finally, and make no mistake, the Blu-ray image is awesome, especially as compared to the SD, reviewed at length for DVDBeaver, and nicely, too, by Kurtis Beard HERE. 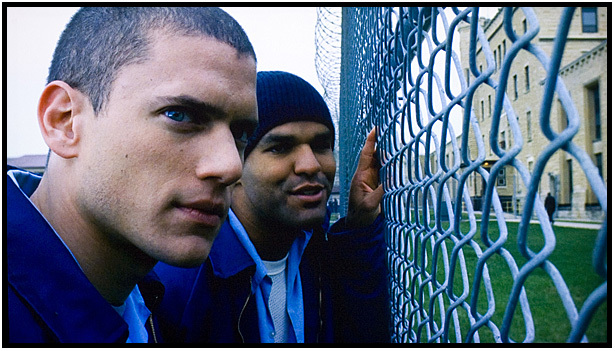 The basic idea is as simple as it is implausible: Michael Scofield (Wentworth Miller) gets himself to sent to prison so that he can break his brother out (shades of Face/Off ). 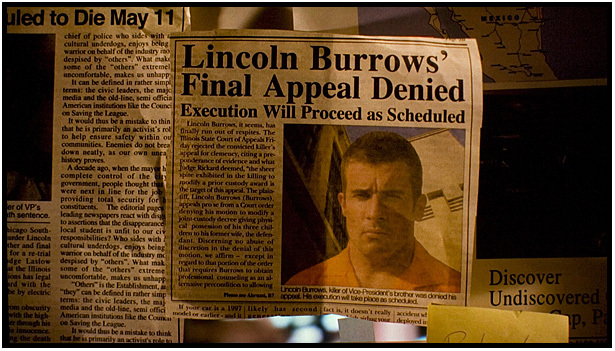 The older brother, Lincoln (Dominic Purcell) has been convicted of Murder One – the victim: no less than the brother of the vice-president. He faces execution in a matter of weeks. As things progress Michael's intentions are discovered by increasing numbers of cons who demand in on the escape. Meanwhile, on the outside, friends of the brothers try to uncover the plot to set up Lincoln, while sunglassed assassins from the Secret Service do their bit to stop them. More details on the show and its background in the SD review HERE. The score of 9.5 indicates a relative level of excellence compared to other Blu-ray DVDs. The score in parentheses represents: first, a value for the image in absolute terms; and, second, how that image compares to what we could expect from the good broadcast quality in HD. This Blu-ray edition, along with Scary Movie, is a serious nomination for the year's best image for live-action. (Among last year's winners were Memento & Black Hawk Down.) None of Kurtis Beard's complaints are in evidence here (Kurtis wrote: "The image is relatively clean with minor levels of grain and appropriate colors; however, there is noticeable pixilation during the action sequences that affect the clarity of the video. The lack of a crisp transfer is a major disappointment, but keep in mind that I am reviewing a screener and the actual retail copy may have an improved image.") The Blu-ray's resolution is staggering, especially in close-ups, some of which tell us more than we ant to know about complexions. 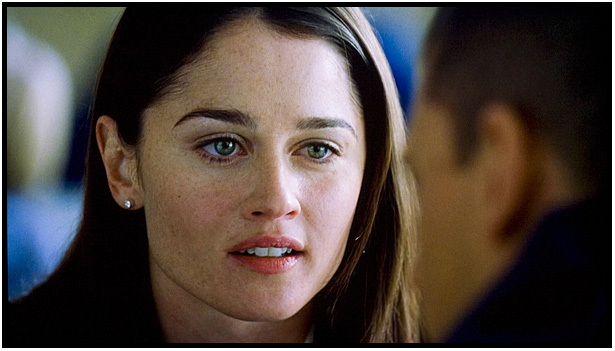 It is especially unkind to Robin Tunney, who plays the committed, but less than brilliant lawyer who keeps missing the boat on evidence that might prove Lincoln's evidence. Smoother complexioned Sarah Wayne Callies, who plays the prison doctor, comes off much better. 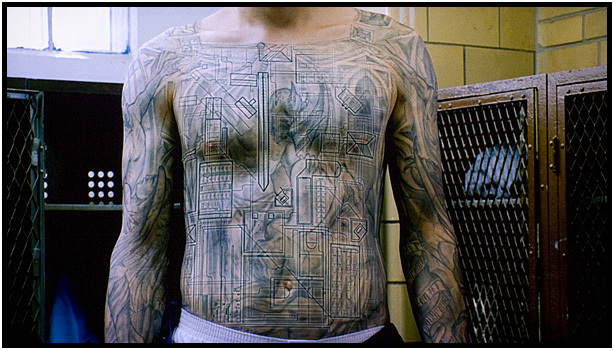 Better still, are the cons - the more pits, the tougher they look. 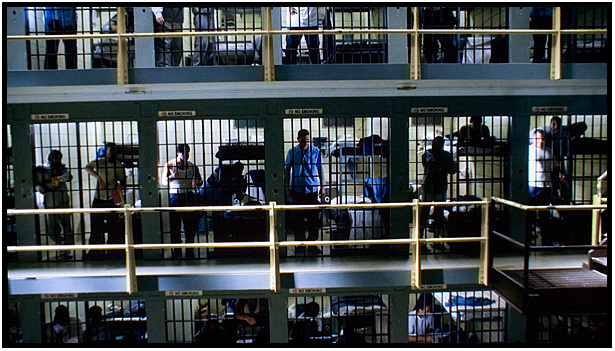 The lighting inside the prison shows off the medium perhaps more than is consistent with actual prison conditions, but it is an artistic choice that proves successful over the course of the 22 episodes. I found the audio mix to be excellent: Lots of clanging, banging and ominous bass noises mixed in just the right proportions with scratching in cement and unambiguous dialog (I never had to activate the subtitles for clarification). The music, while never up to the standards set by Alias, with its subtle variety of hues and moods, is nonetheless more than adequate to the task of keeping that pulse pounding. I like the extensive menu options for each disc and subsequent episode. I think they would have been better with fewer chapters and larger thumbnails, but at least there are chapter titles to help us find our way. I took off a point for their being no chapter stop for the beginning of a new episode. 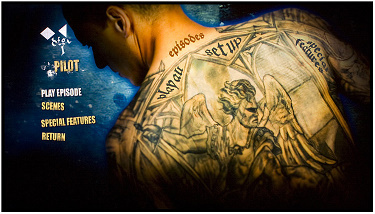 Each episode's chapter 1 begins with the usual "previously on. . ." while chapter 2 begins after what would have been the station break, by which time several minutes of new program has already passed. This is also as good a place as any to bring up once again my general displeasure with Blu-ray cases, compromised all the more by a 6-disc presentation. Four of these discs are placed on double sided inserts that were never designed for permanence. While opening the box at one point, one of these flaps simply fell on the floor. No damage was done – not to the discs, nor the flap "locks" (as would have happened with the more brittle CD jewel case equivalent), but the whole arrangement is inconsistent with the quality suggested by "high definition" as well as the price tag. The Extra Features are all ported over from the SD edition. Comment in the SD review by Kurtis Beard HERE. The major extras are the commentary tracks on various episodes offering insight from numerous cast and crew members ranging from Brett Ratner to Paul Scheuring. 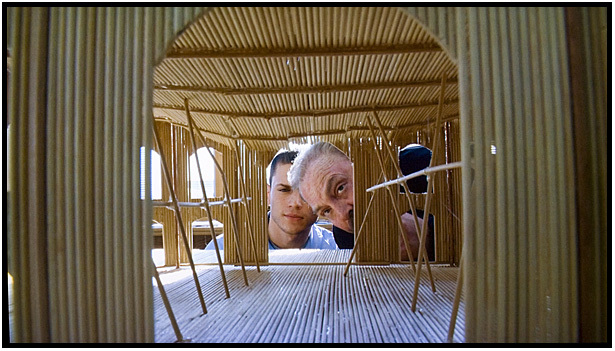 Scheuring is the more insightful of the two and speaks fluidly and concisely. Ratner has a relaxed vibe and contributes some interesting information. 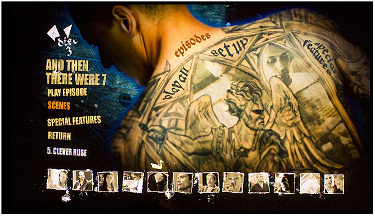 There are also three featurettes on disc 6, including the “Making of Prison Break,” which details various stages of production beginning from the original conception of the series. 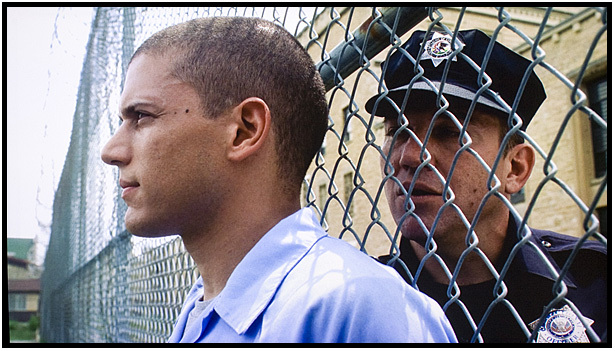 Again, insight is offered from various cast and crew with particular note of Wentworth Miller offering his opinion of his character. Miller is an interesting personality, and it’s fascinating to see him attempt to illustrate the similarities between his character and himself. Unfortunately, the interview clips with Stomare offer an embarrassing take on the future direction of the series. 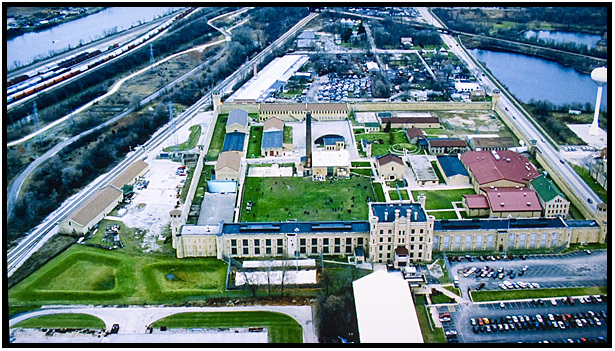 The second featurette, “If These Walls Could Speak: Profile of the Joliet Correctional Center,” offers a history of the prison used in the film. Various talking heads have plenty to say about past inmates and the prison’s reputation. 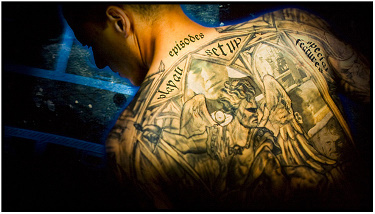 The last featurette, “Beyond the Ink,” is my personal favorite of the three as it addresses an important aspect of the show--the use of tattoos. 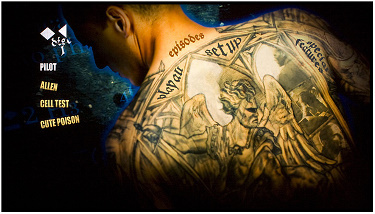 Since tattoos are so integral to Michael Scofield (the main character), I was intrigued to learn about the development and eventual creation of Scofield’s enormous tattoo. 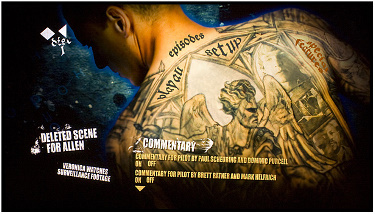 The featurette also offers the opportunity to see original concept art. I have to say I was surprised by how much I was drawn into this series. I was able to watch several episodes at a time, back to back. I was pleased to find that during the course of each episode there was a minimum of recap. Several of the cons, both those who lived out the season and those who didn't, were particularly good (Robert Knepper as "T-Bag", the con at the top of the sexual predator food chain, and Peter Stormare as the mob-connected con who doles out privileged assignments come in for special mention.) It might have been the fact that the show is in high definition, or that I hadn't watched an American TV series in a couple of years, or it could have been that I just liked it better than 24 or Lost, which I did. 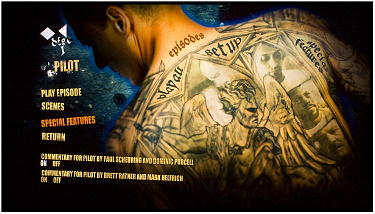 Prison Break - Season One is Fox's first television series to come out on Blu-ray. One of the interesting things about this edition from a marketing point of view is that Fox is bringing out Season One before Season Two. This is contrary to the more common practice of starting with the most recent season available (e.g. The Sopranos and Lost). Season 6, Part 1 of The Sopranos came out on Blu-ray just a few weeks after the SD and Season 3 of Lost will come out simultaneously on DVD & Blu-ray. 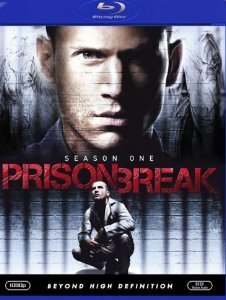 However, the SD/DVD of Prison Break has been out already for over a year, with no expectation that I was aware of that an HD version would see the light of day. So I wonder who Fox anticipates is the target audience for this set. Wouldn't such people have already made their investment? Or would they upgrade? The answers might tell the studios something about the place of HD for TV series. Would HBO put out Deadwood or Rome on HD/BD knowing that many potential customers have already made an expensive purchase? I would, but am I representative?